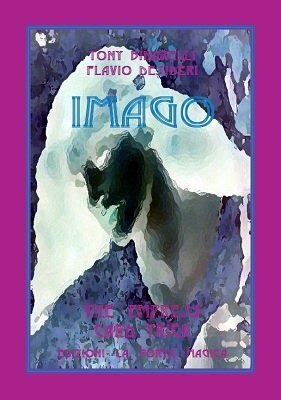 Imago is the ultimate version of the classic "Princess Card Trick"! The thought of card really disappears! In Imago you will find the explanation to perform the basic "Princess card trick" and other four routines by Tony Binarelli. Hypnotic Illusion: the performer states that, through hypnotic suggestions, it is possible to alter the memory and that he would like to prove it. He asks for two people to help him: the first one withstands the suggestions while the other one will be the witness of reality. Super Brainwave: six cards are removed from the pack, the performer shows them to the spectator and invites her to think on one of them. After that, the fan is closed and the spectator names her card. When the cards are fanned again, they are now only five and the thought one has vanished and it is found face down in the deck. Dunninger's Third Millennium: having removed six cards, the performer shows them to a spectator inviting her to think and memorize just one of them. After that, he states that he will make the card disappear from the packet. He asks the spectator to name the chosen card. The packet is fanned and, now, there are only five cards: the missing one is the card the spectator thought of. The performer then takes his wallet and removes an envelope containing the spectator card. Power of Numbers: a thought card vanishes from the packet shown to the spectator. From the deck you deal as many cards as the value of the chosen card and, in that position, you find it.